Our favorite beverages usually come in receptacles that are manufactured through different sets of heavy duty machinery. A&A Coatings takes pride in our many years of experience and unmatched expertise in spraying canning and bottling equipment components. Our coatings create an abrasion-resistant and hard ‘lining’ for various wear surfaces, most notably the wear plates that are integral components inside canning and bottling equipment. We can also repair end-of-life bottling equipment components at our state-of-the-art thermal spraying facility in New Jersey. A&A Coatings knows very well that the machinery used for bottling and canning processes have to stay abrasion and wear resistant in order to operate efficiently in the production facility. That is why we use both inert materials such as ceramics for building wear and corrosion resistance, and metallic materials for rebuilding worn out canning equipment components. Over the last 7 decades, A&A Coatings has built its distinct identity among OEMs and end users, many of whom have returned to us time and again for availing our specialized solutions. 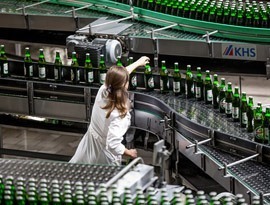 If you want to ensure that your bottling and canning processes do not experience any downtime, you should certainly tap on our expertise in protecting the components within your industrial equipment. To know more about our tailored solutions for the bottling and canning industry, simply send us an inquiry today!